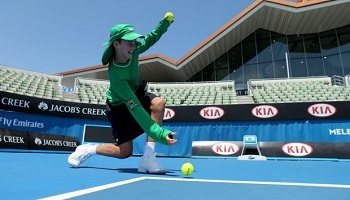 Take in the first Grand Slam of the season in luxury with tickets to a day and night session. 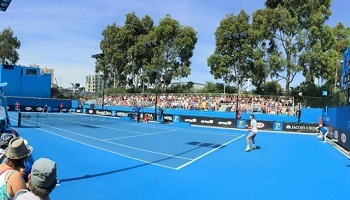 Combine your love of tennis with some unforgettable experiences and get active in Melbourne, Cairns, Sydney and Auckland. 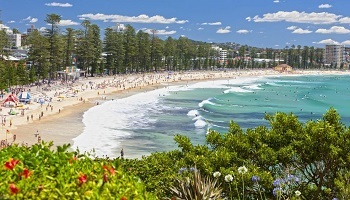 Visit Phillip Island, the Great Barrier Reef, Kuranda rainforest, the Blue Mountains and the rugged coast and forest of Auckland. Tour Melbourne by bike, cruise Sydney Harbour, race a yacht in Auckland, take in dinner and a performance at Sydney Opera house and dine atthe Sky Tower in Auckland. Dinner at the Orbit Restaurant, the highest dining location in New Zealand! 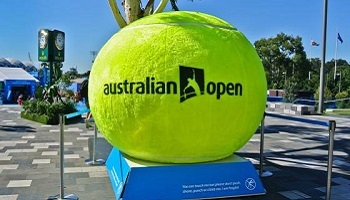 Note: Australian Tennis Open Jan 16-29 Jan, 2017. This itinerary is based on tennis tickets for 1st week schedules (16-21 Jan, 2017) - for pricing on 2nd week tickets please contact Aspire. On arrival into Melbourne you will be transferred by private vehicle/driver to The Langham Hotel, where you will stay for FOUR nights in a Club River Guestroom . Join Real Melbourne Bike Tours at Rentabike at Federation Square, Riverbank level (near the Riverland Bar) Melbourne, to commence your 4 hour Melbourne City bicycle tour. Enjoy this fun tour exploring Melbourne's grooviest streets, parks, shops, cafes and hidden laneways on this leisurely ride through Melbourne. See iconic Melbourne sights including Yarra River, Sports Precinct and Melbourne Cricket Ground, Parliament, St Patrick's Cathedral, Fitzroy Gardens, Lygon Street (Little Italy), Queen Victoria Markets and hidden inner-city laneways. Lunch is included. Tour concludes at approximately 2.00pm at Federation Square. ACCOMMODATION - Shangri-La - Superbly positioned within the cosmopolitan Pier shopping complex, overlooking the Marlin Marina and the Coral Sea; adjacent to Trinity Bay Esplanade the hotel serves as a gateway to the Great Barrier Reef. Designed with the surrounding tropical elements in mind, materials throughout the hotel are inspired by the rainforest and reef – interior finishes of granite, sea-toned walls, bubble-like light fittings, natural timbers and marine ply provide links to the natural world. Access to the Horizon Club Lounge including daily full breakfast, snacks and refreshments throughout the day, complimentary evening pre dinner drinks and canapés, complimentary fruit basket and daily newspaper. This morning you will be collected by coach for your Great Barrier Reef day tour. 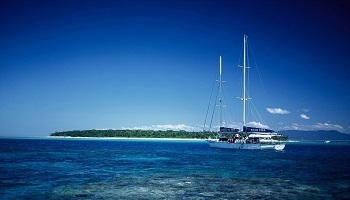 Quicksilver's modern wavepiercing catamarans cruise to reef activity platforms moored at the ribbon reefs located at the outer edge of the Great Barrier Reef. The Agincourt Ribbon Reef systems provide unsurpassed coral formations, colourful marine life and spectacular underwater visibility. Quicksilver provides facilities for swimmers and non-swimmers to experience this stunning reef world. Passengers can explore the reef from the comfort of a semi-submersible, an underwater observatory, or can snorkel and dive in an underwater world of unique colour and marine life. Optional activities include introductory diving, certified diving, ocean walker or an adventure snorkel tour with a Marine Biologist. Scenic helicopter flights provide another perspective. Once vessel has returned to marina you will be transferred by coach back to accommodation. Transfer to Caravonica Lakes to board the Skyrail Rainforest Cableway at the scheduled time advised by the driver and glide above the rainforest canopy to Kuranda. There are two stations enroute where you can alight and enjoy a walk through the rainforest to spectacular lookouts or visit the CSIRO Interpretive Centre. Arrive at Kuranda to enjoy free time for approximately an hour and a half, and explore the 'Village in the Rainforest' and its many attractions including the Heritage Markets which operate daily. Enjoy lunch (own expense). Other Kuranda Village attractions you may wish to visit are Birdworld, The Australian Butterfly Sanctuary or Kuranda Koala Gardens (own expense). 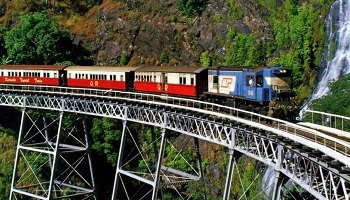 At 3.30pm board the Kuranda Scenic Railway in Gold Class for the journey to Cairns, and enjoy spectacular views as the train travels through 15 hand cut tunnels and past spectacular waterfalls. Stop at Barron Gorge to view the falls before arriving at Freshwater Station. 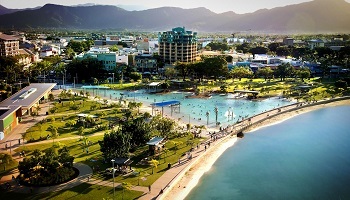 This morning make your way to Cairns airport for your flight to Sydney. On arrival into Sydney make your way to the Sydney InterContinental, you will stay for FOUR nights at this superbly situated hotel. ACCOMMODATION - Intercontinental - Rising majestically behind the 1851 Treasury Building’s sandstone façade, now a listed heritage building right in the heart of Sydney. The Intercontinental offers panoramic views over the entire city, and all rooms are tastefully furnished with the attention to detail expected of this internationally renowned, five star hotel group. Walk out of the lobby and straight into Sydney’s Royal Botanical Gardens, literally across the street, marvel at the latest exhibition in the Art Gallery of New South Wales or stroll down to the famous Sydney Opera House. All of these attractions and more are within easy walking distance of the hotel. In house facilities include a fully equipped gym and heated indoor swimming pool. At 1230pm wander down to Circular Quay, the departure point for your luxury 4 hour small boat Sydney harbour cruise experience. Be engulfed by the beauty of Sydney as you 'cruise like a local' aboard Calypso, a 52 foot motor yacht. 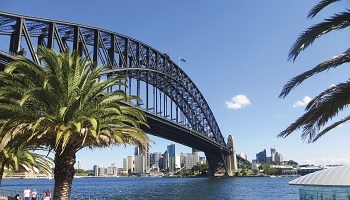 Cruise the foreshores of Sydney Harbour past world famous, iconic landmarks including the Sydney Harbour Bridge and the Opera House before dropping anchor in a secluded cove to enjoy lunch. Then there is the opportunity to go for a swim, row into the beach, try your luck at fishing or just relax. During the day self explore or relax. Late afternoon - Red Carpet - A Reserve Opera & Aria Restaurant (Includes:Performance Ticket, Dinner & Sydney Opera House Tour) Join your tour at the Sydney Opera House. Check in at the Information Desk in the main Box Office foyer where you will be welcomed by a Guest Liaison Representative at 4.45pm. Your evening starts with The Sydney Opera House Tour, where your guide will take you on a journey inside the Sydney Opera House. You'll enjoy a look inside the theatres before the curtain goes up. 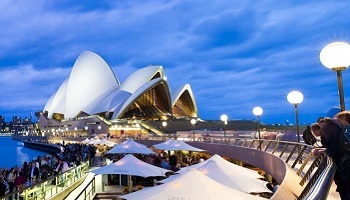 The tour is followed by a pre-theatre, three-course dinner at ARIA Restaurant over looking Sydney Opera House. 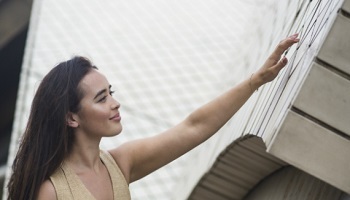 You’ll then enjoy a world-class Opera Australia performance of choice including an interval drink at one of the theatre bars, while taking in the views of Sydney's amazing Harbor lights. 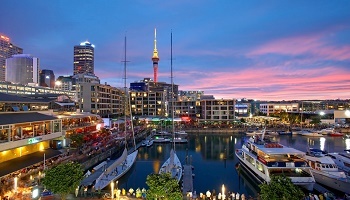 ACCOMMODATION - Skycity Grand - This hotel is an urban oasis of contemporary elegance and style. Luxuriate in one of the exquisitely appointed guest rooms, enjoy award-winning cuisine or treat yourself at the rejuvenating East Day Spa. There is also a range of other 5 star facilities and guest services to make your stay superbly restful and comfortable, including a well-appointed gymnasium, a 25 meter heated lap pool, sauna and spa. This evening make your way down to the elevators for an amazing vertical joy ride to the Orbit Restaurant, the highest dining location in New Zealand! Located up the Sky Tower, Orbit revolving restaurant provides New Zealand cuisine in intimate surroundings. Enjoy a 3-course dinner while enjoying wonderful views of the city and surrounds. You may also explore the main observation deck of the Sky Tower (328 meters high) and if you are brave enough, stand on the glass floors to see Auckland directly below you. An amazing experience. 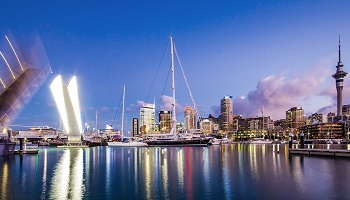 A Bush & Beach vehicle will pick you up from your inner city accommodation to commence a full day excursion out to Auckland’s untamed and unpredictable West Coast. First stop is the Arataki Visitor Centre situated within Auckland’s largest Regional Park, the Waitakere Ranges Regional Park. The breathtaking panoramic views from the sweeping decks extend from the Tasman Sea to the Pacific Ocean. Absorb the area’s history and admire the magnificent traditional Maori carvings that stand guard. 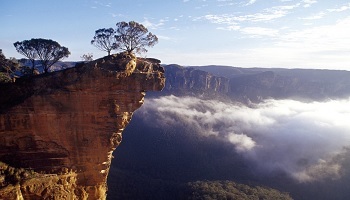 Continue further west to the wild and rugged West Coast, where you will experience the area's isolation. Guides walk participants through part of Auckland’s coastal rainforest while explaining about the local flora and fauna. 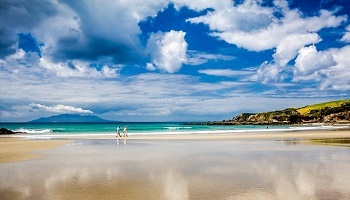 Then stroll on an awe-inspiring, rugged West Coast beach and feel the soft black sand and breathe the clear ocean breeze before enjoying a kiwi-style picnic lunch at a scenic location. Your journey then takes you to an area of untouched original rainforest with mature 1000-year-old kauri trees. A moderate level of walking ability is required for walks of up to 1 hour duration. Tour concludes at approximately 5.00pm, at which time accommodation drop offs will commence. Board your Explore NZ sailing vessel at the Explore NZ Kiosk, inside Auckland's Viaduct Harbour, end of Quay Street, past Voyager Maritime Museum and situated to the left alongside Snapdragon restaurant, to commence the ultimate thrill of participating as a crew member while match racing, America’s Cup-style. The America's Cup is the world's oldest and most prestigious sporting trophy and the ultimate yachting regatta. Usually the domain of billionaires and elite professional yachties, the vessels NZL 40 and NZL 41 offer a unique opportunity for everyone to try their hand. The experience begins in the Viaduct Harbour where clients will meet the crew and go through a short race and safety briefing. The yachts then depart the Viaduct Harbour and go through a period of practice before the action really begins: line up in the pre-start and compete head-to-head on an authentic course layout. Cruise concludes approximately 3 hours after commencement, back at the Explore NZ Kiosk, Viaduct Harbour, end of Quay Street, Auckland.